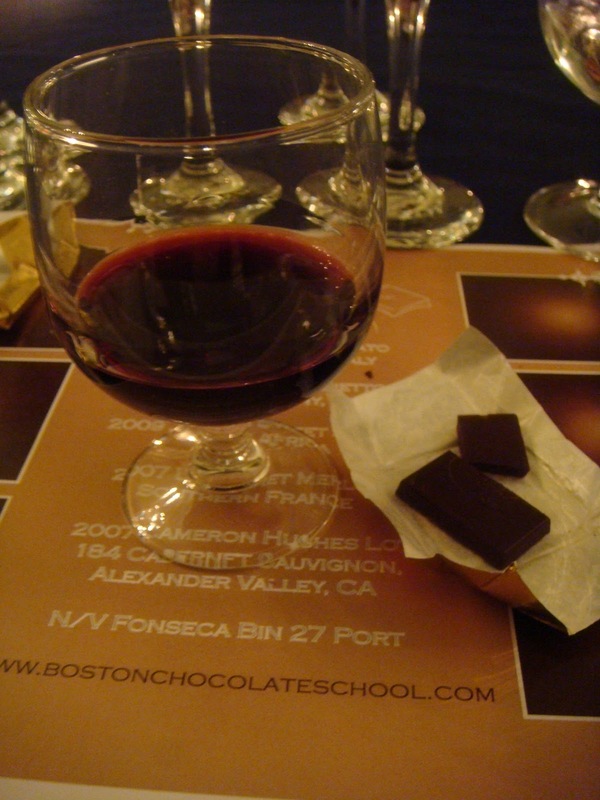 Have you heard of Boston Chocolate School? Sure sounds like the kind of school I'd love to attend if I had to go back to school! 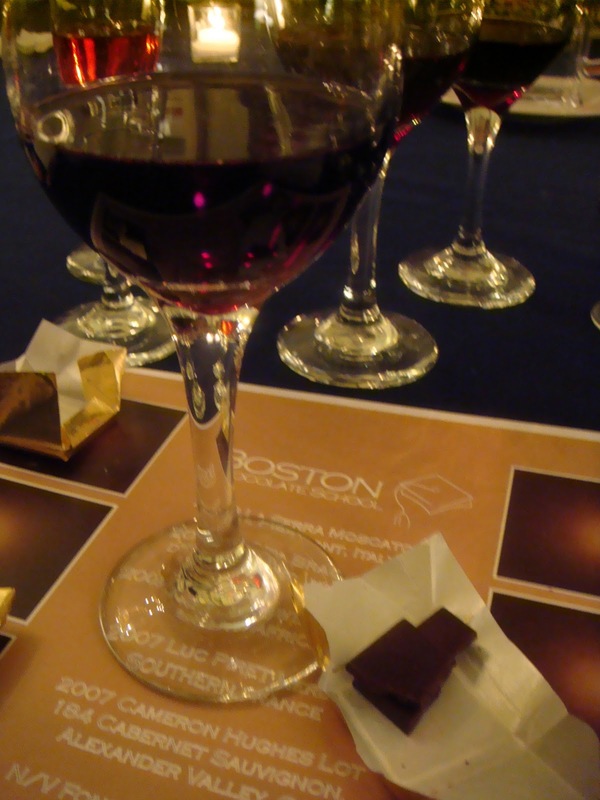 "Ever since the first grape was picked and the first cacao bean harvested, chocolate and wine were meant to be together. 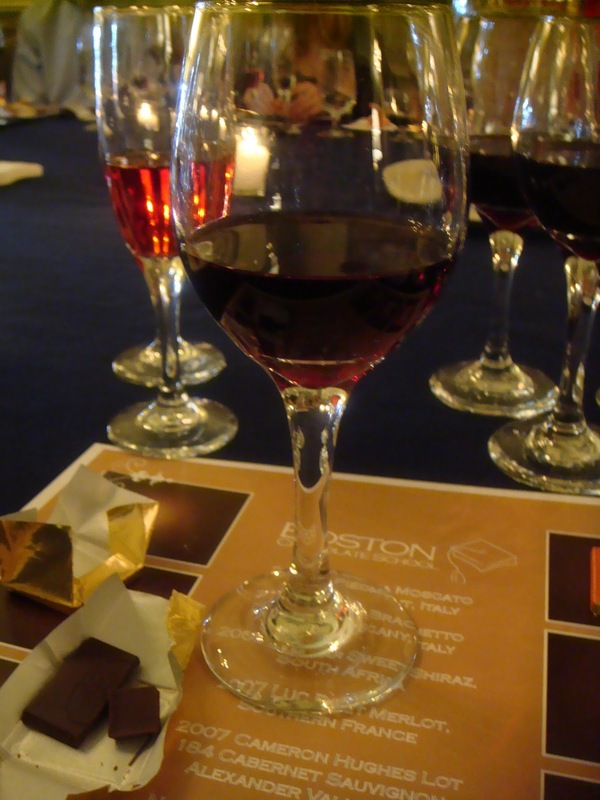 Perfect for beginners or for experienced chocolate tasters, Boston Chocolate School’s Evening of Chocolate and Wine will teach you how to expertly pair wine and chocolate, creating new and unexpected tastes that delight the senses." Before the class began at 7 p.m., Daisy, Meghan, and I met up at Bistro du Midi for some light appetizers and drinks. The bar was quiet, the bartender friendly, and the food delightful. It was the perfect way to kill a little time between work and the start of the class. After we sampled fried artichokes, fried calamari, and eggplant and olive dips, we walked a few blocks down Comm Ave and ran into Lara as she was heading into Boston Chocolate School, which is located at 44 Commonwealth Avenue at The College Club of Boston. I'd always wondered what those beautiful brownstones on Comm Ave look like inside. It turns out that the College Club is not only host to Boston Chocolate School but also a bed and breakfast. A couple of the rooms were open and we were invited to head upstairs to check them out if we wanted to. Of course we wanted to! After checking out the rooms (which are only $75 a night right now in the off-season), we headed back downstairs and snacked on fruit, cheese, and passed hors d'oeuvres, like bruschetta in phyllo cups, coconut shrimp, and phyllo-wrapped asparagus. Soon enough, the clock struck 7 and we were ushered into the "classroom," which was actually a gorgeous dining room, to begin the class. At each of our places was a placemat set up with the six pieces of chocolate we would be tasting, as well as the names of all the wines we'd be trying. In front of each of us were six glasses of wine to pair with the chocolates. See - Check the color and clarity of the wine. Swirl - Agitate and oxygenate the wine. Smell - It's ok to switch and smell the wine before swirling if you want to pick up on the secondary aromas. Sip - Inhale through the mouth (carefully) while you sip. Savor - Reflect on everything you just experienced. Listen - Check for the snap. Look - Make sure the chocolate is shiny and free of bloom. Smell - Inhale the aroma of the chocolate. 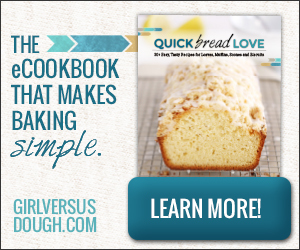 Taste - Lay the piece on your tongue and let it dissolve. Sip - Try sipping the wine while the chocolate is dissolving. 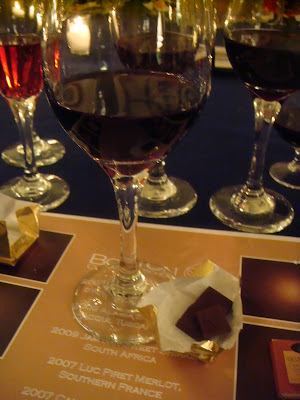 Notice the changes in flavor of the wine and the chocolate. I took copious notes throughout the entire class and really learned a lot about the chocolates and wines that we tried, including details about wine- and chocolate-making processes. 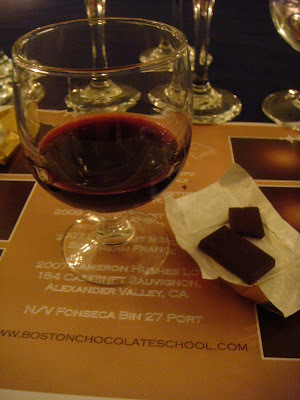 If you love chocolate and wine, I highly recommend this class. Don't we all look like we had fun? An Evening of Chocolate and Wine is offered every two weeks on Wednesday nights. Tickets are $50 and should be purchased in advance. In addition to this event, Boston Chocolate School also offers truffle making classes and chocolate tours. I'm already making plans to go back for a truffle making class. I need to work on my chocolate tempering skills! 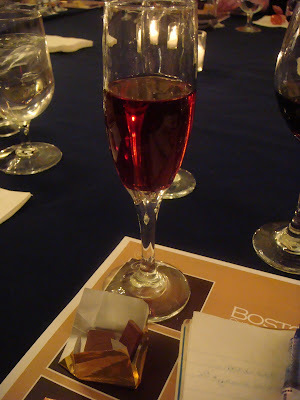 Boston Chocolate School hosted a special blogger edition of this class, and our tickets were complimentary. What do you think? Would you enjoy a class like this?